The First Toilet Shown On Television Appeared In An Episode Of? Which Band Derives Its Name From A Unit Of Measurement? If you’re a reader of a certain age, you can recall a world totally foreign to younger folks: a world where television broadcast standards were so strict that things like pregnant women, couples sleeping in the same bed, and the interior of bathrooms were simply not allowed on television. In fact, the first appearance of a toilet on television was considered so scandalous to CBS executives and FCC censors that technically the entire toilet never appeared on screen—only, as seen here, the toilet tank. How’s that for an obsession with obscuring the trivial aspects of everyday life? Here’s the story about how that tiny sliver of a toilet appeared briefly on screen. 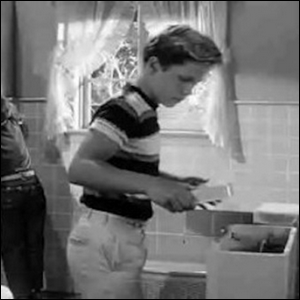 For a particular episode of Leave It to Beaver, the plot hinged entirely on the boys buying a baby alligator from a mail-order company and then attempting to hide it in the house. The only practical place two boys could hide an alligator without it being immediately discovered was a toilet tank. When faced with scrapping an entire episode, CBS executives eventually yielded to the show’s producers, but with a very strict compromise. Not only would the actual toilet bowl not be shown on television, but the actors interacting with it would be required to act as if it was simply a container they were putting the alligator in and make no allusion through dialogue or actions as to the function of the device—a joke about “But Beav, what if the alligator gets flushed down the toilet?” was totally out of the question in this context. The boys had named the alligator “Captain Jack” and simply referred to the toilet tank as “Captain Jack’s aquarium”. If you think that must have been the beginning of the end for needlessly restrictive filming rules, you’d be mistaken. For decades after Leave It to Beaver, the strict rules were still in place. In fact, on The Brady Bunch, a show about a huge blended family sharing a home, the show did let viewers see the family bathroom but, very curiously, the family bathroom had no toilet at all. The sound of a toilet flushing wasn’t heard on television until an episode of All in the Family in the 1970s, and it wasn’t until the 1980s with the debut of Married with Children that incorporating a bathroom and bathroom habits became normalized. Today, however, it’s not uncommon to see the bathroom and the toilet itself appear in everything from serious dramas to slapstick comedy.